I have the tendency to look at costume inspiration sources and pick the most ridiculous dress imaginable to make. This is why things like The Portrait Dress and my bloomer dress exist. 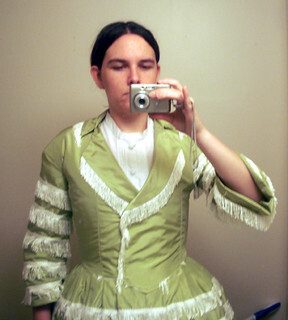 I love being silly in costume so when Aubry of A Fractured Fairytale found a ridiculous 1840s fashion plate, I knew I had to be the buttoned up matron to her slutty French cousin. Thus, today's post is about the Fringed Fabulosity. Aubry wanted the one on the left, and I was consumed with lust for the ridiculous fringed one on the right. I had to have it! 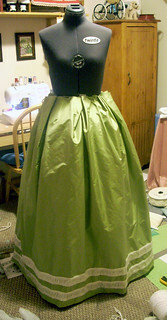 The dress is something like 8 yards of green silk taffeta with a million yards, give or take a few, of cream fringe. I bought it in bulk from Cheap Trims because of the million yards issue. 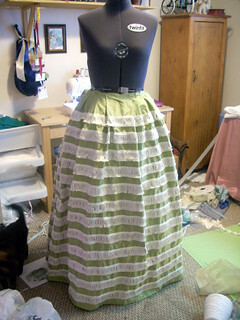 The skirt is just a rectangle with 12 rows of fringe sewn on. That sucker's heavy, let me tell you. I swear I do clean my sewing room sometimes. 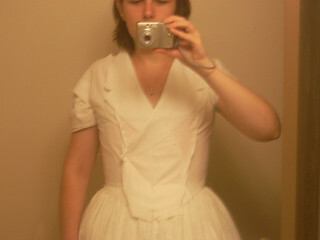 Feeling good about my life, I went on to bodice mock ups. And abruptly slammed into a brick wall of utter frustration. I don't have pictures of the final mock up, but I do know that after about five tries, I threw up my hands and moved on. That collar was the bane of my existence. I made the dang thing anyway, though you can tell by my initial try on, I was less than pleased. 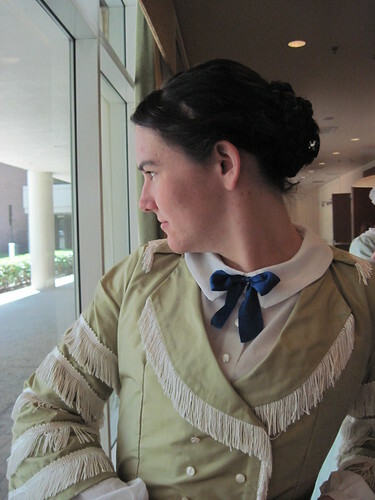 In retrospect, I really should have lined the collar with something that would give it a bit more body, but I knew nothing about tailoring and had never attempted a shawl collar. It could have been much worse, really. 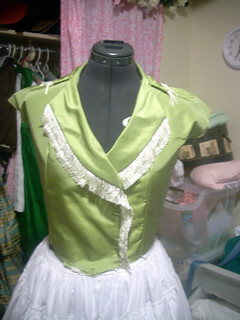 I finished the bodice with bias tape made from the green silk and a bunch of vintage mother-of-pearl buttons that I'd bought at Costume College the previous year. 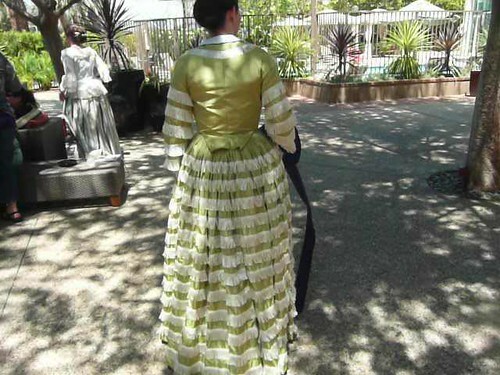 The dress itself is worn over my corded petticoat, a three-flounced petticoat, and a single flounced petticoat. It gave a subtle bell shape, but it really could have had more umph to it. 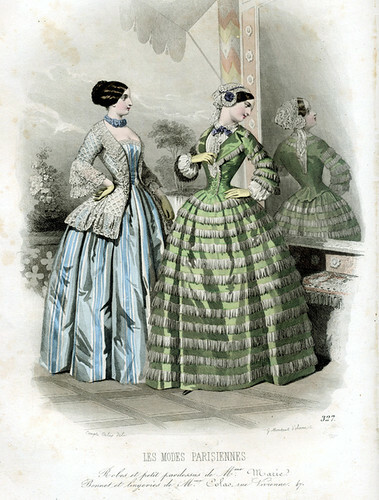 I have determined that fashion plates lied about the shape of 1840s skirts. So yeah, I didn't make the dumb little cap thing, but I did make a new chemisette and undersleeves from a floaty cotton lawn. When I wore the whole thing put together at Costume College, I fell in love with it and decided I loved it, flaws and all. 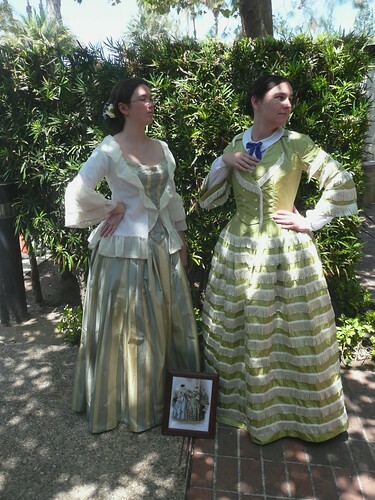 Aubry and I carried around the fashion plate and perfected the pose so we were pretty much insufferable the whole day. It was awesome! This dress was heavy, man. Seriously. This dress is amazing! I love it!! 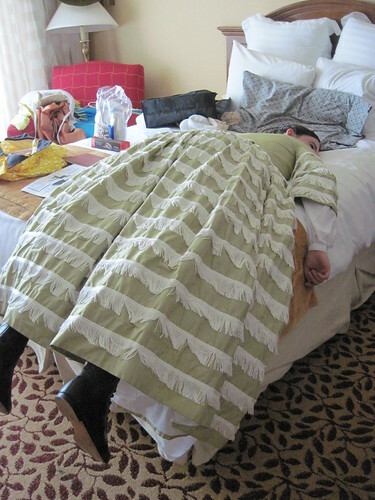 In which I chronicle my completed costumes, research, and costume events.